In addition to NIRA's monthly public launches, we host about a dozen private launches for larger Scout packs each year. In 2011 we had 15 scout groups, totalling 300 to 400 scouts, fly with us! (2012's flying season was considerably reduced as East Branch was unavailable much of the summer.) Joe Charaska is NIRA's Scouting and Youth group liason, and the primary contact for scheduling launch opportunities and assistance for other events. NIRA provides you access to a field (East Branch Forest Preserve in DuPage county) to legally and safely fly model rockets. We can save you expense by providing launch equipment for large groups. 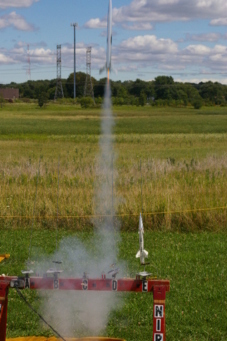 We may be able to do a short presentation related to the hobby of model rocketry at your Pack or Den meeting. We do expect and require all participants to abide by NIRA's scout launch rules. Two great resources about planning rocket-related activities: Successful Rocketry for Scouting, 4-H and Other Youth Groups from the NAR, and NASA's Rocket Activities, a series of web pages describing both classroom and field activities. Based on my observations of previous scout launches, your scouts are going to have a great time with this activity. Small groups can often be accomodated, at lower total cost, at a regularly scheduled club launch. If there are too many scouts flying rockets (15 or more), or if the monthly launch date doesn't fit your schedule, you may request a date for a private launch event. If we schedule a date just for your pack, then there is a $45 non-refundable permit fee, needed 30 days in advance, required by the DuPage Forest Preserve District and a $25 refundable club fee to reserve the date. There is no fee for smaller groups flying at a club launch, but contributions are cheerfully accepted and help with equipment upkeep.